Seven Indian fishermen were arrested by the Sri Lankan Navy Saturday and taken to Trincomalee for fishing in Sri Lankan territorial waters. 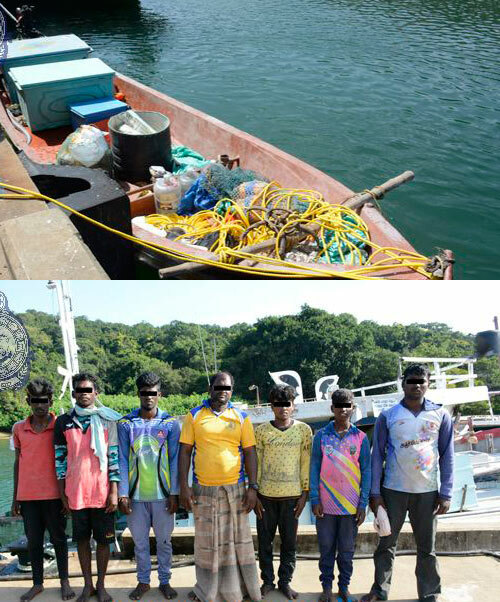 The Indian fishermen werre engaged in illegal fishing in Sri Lankan territorial waters of Eastern seas and were apprehended by SL Navy, today (09). Accordingly, the apprehension had been made during a Naval patrol in the seas off Kokkuthuduvai area in Pulmudai and the dhow they used had also been taken into naval custody. The apprehended fishermen were brought to the Naval Dockyard and produced for a medical test before they were handed over to the Assistant Director of Fisheries in Trincomalee for onward legal action, the navy said. According to Indian media reports, the fishermen are from Nagapattinam and had set out to sea on Friday.